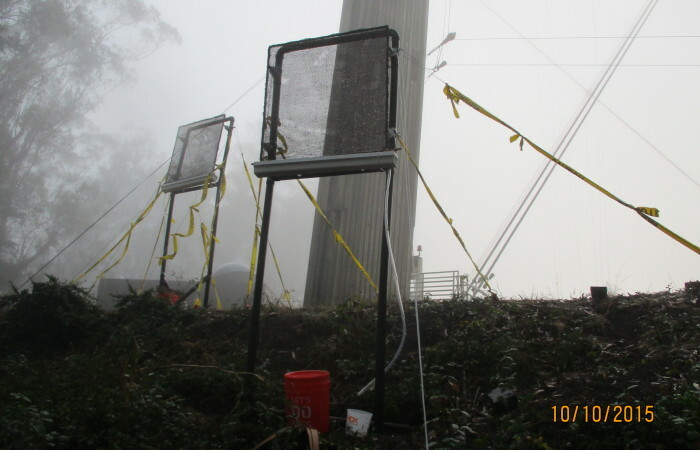 Standard Fog Collectors (SFCs) are environmental testing devices used to determine if a given location is suitable for fog water collection. This design is based on the 1994 Journal of Applied Meteorology #33, by Schemenauer and Cereceda. The design has been further refined by members of the charity FogQuest.org. Fog collectors require open space and direct contact with dense fog to produce water. Obstructions such as nearby trees and buildings inhibit fog collection. Last fall and winter SFCs placed at Sutro Tower produced an average of one quart of water per day. The estimated water production for this summer is 3-5 quarts per day. The threshold FogQuest used for determining if fog collection is viable on a large scale is around 5 quarts per day. After fog collection testing is complete, the SFC can be sold back to the manufacturer for the majority of the purchase price if it is not too damaged. The delivery charge includes 1 hour of installation assistance and the delivery is to San Francisco, Alameda, Contra Costa, and Marin County only. Four sets of cables to anchor the SFC. Four 15 inch steaks and one 5 foot tree steak. One 7 gallon BPA-free plastic water collection tank with tubing to connect to trough. These are available in our online store. Before purchasing, you may wish to obtain more information on fog water collection benefits and drawbacks by emailing Chris Fogliatti.